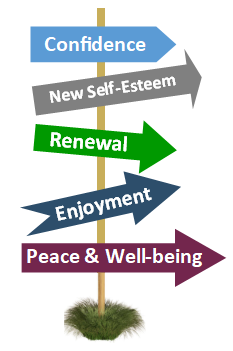 of renewed meaning and purpose in life’s second half: To help them get started and/or progress on their own path to psycho-spiritual fullness and contentment. Q1: What is Conscious Aging as a Spiritual Practice (CASP)? A: The key words are conscious and practice. In younger adulthood most of us unconsciously move through our workaday life taking care of everyday responsibilities that never seem to end. Raising our families and doing our job without thinking too much about how these normal activities nurture our spirit and soul. Or not! At midlife, and in retirement, this pre-programed busyness gives way to open time; into which a variety of new questions begin to take root. CASP entails becoming increasingly conscious of, and paying close attention to those questions, and their implicit personal needs, often long subordinated to those other responsibilities. Typically, they relate to hopes, dreams, aspirations, and needs that nurture us and give us life as we age. Or those that drain it from us. Also, it entails increasing conscious motivation and commitment to do more of what nurtures and less of what drains. The more often we do this as a regular practice, the better life gets for us, on our own terms. As clients increasingly experience the benefits of doing what nurtures their soul, the easier and more natural it becomes to do more. That is, the more it becomes a spiritual practice; one that nurtures their deepest selves. Q2: So, what is that you actually do? A: Our professional practice is dedicated to assisting interested people develop and implement their own CASP program as a way to find and experience a NEW future in their second half of life. One that is qualitatively different from their past. Our clients typically present with one of two steams of need. One is people who are basically confused by their experience of midlife and/or retirement, and desire some guidance to get their life back on track. Some clients arrive at midlife’s new questions knowing there is something more to their life than what they have experienced thus far, and appreciate our help in learning more about what that is. Perhaps they are individuals or couples unprepared to the new retirement lifestyle, and looking for insight and guidance to chart their new unfolding future. The other stream of clients often come out of various degrees of adversity experienced in various aspects of dysfunctionality and/or abuse in their family of origin. These clients typically present with similar issues to the first group, but issues significantly compounded by their upbringing because they unconsciously carry a great psychological burden, or multiple burdens, that precludes simply plotting a new course for a happy healthy new future. Our vocational mission, in our own retirement, is to facilitate a client-centered process that encourages clients to grow into more of the fullness their own second half of life offers in their real-life context. Our client-centered approach is not a one-size-fits-all projection of something they should or could do to deny normal aging. Through our Life Review and Repair program we help clients identify and move beyond the future-limiting stories we all tell ourselves. One example is helping clients transition through the so-called midlife crisis, which need not be any crisis at all. We do this partly by showing how many of our challenges are self-created, because they are rooted in our long-ago life-launch, and by supporting them in their own midlife transition. Similarly, is the transition to retirement. Our practice sits at the junction of support and guidance: At the crossroads of life coaching, pastoral counselling, and spiritual companionship. All of which is informed by direct personal experience. Our client-centered approach is unlike widely-promoted “fun and easy” fixes, or claims of “read this book and be cured in 4 easy steps.” And it certainly has nothing in common with the advertisement I saw recently promoting a “Reverse Aging Miracle Cure.” None of which seem to require much from you but your credit card. Our CASP approach encourages and supports unfolding and maturing psycho-spiritual growth that yields increasing awareness of the blessings of older age not available to younger people. As such, it is not a short term “therapy” to “fix” something—that really isn’t broken. Rather, it is an individualized program that committed clients practice, usually for the rest of their life; in their own way and at their own pace. In medical terms CASP is “dose related.” This means clients receive results directly proportional to her or his commitment to their personal practice. The more people commit to their practice, the greater the results. Also, that they can ease into it when the time is right for them, and proceed at their own pace. This is important because we can’t simply decide to adopt CASP and get all the results we can imagine. It is not like taking Tylenol and expecting our headache to be cured. Like many others, I have found one of the major challenges to maturing into life’s second half is my commitment, and ability, to remove obstacles to it. Most of which come from my family of origin. Growing into a new future really does mean growing beyond our history, and the baggage we carry. Q 3: Is CASP a religious program? A: No, CASP is not a religious program. Unless the client wants it to be. It is a client-centered psycho-emotional-spiritual program of increasing and maturing discovery. People often confuse the two, but they are different. Religion is a belief in an external power, typically accompanied by a doctrinal teaching about right and wrong. Spirituality is our personal maturing sense of value, meaning, and purpose. The foundation of our professional practice is that each of us has a thread, a theme, running through our life: And a window or frame of reference through which we each make sense of our world; a set of values and beliefs by which we operate most days. A set of hopes and expectations that draws us forward. All of which are elements of our own unique Spirit seeking to make sense of, and enjoy and celebrate our life honouring our own personal spirituality. Our coaching flows in client-centered ways as each person works their way toward the things that are ultimately important to them and develops an inside-out expression of their individual sense of their life’s meaning and purpose. This may or may not reflect formal religious teachings or beliefs. The “psycho-” part refers to long-standing recognition that emotional and spiritual wellbeing are intertwined, like our DNA: that we can’t have emotional health without a healthy spirituality. Indeed, most of what we consider spiritual illness is actually emotion-based. If you think of our spirituality as a “still, small, voice” speaking to us when we are quiet and open to it, and think about the immediacy of the “siren-call” of our emotions, it is easy to see how it is that our emotional wellbeing generally takes precedence. Compounding this is the fact that most of our day to day thinking and activities are habitual; while the key to giving our spirit precedence is to be intentional about doing so. Q4: Why do you place so much emphasis on new possibilities and a new future? A: Ask yourself: “Do I really want 2019 to be a repeat of 2018 … or any other year?” Or, ask yourself, “what keeps me from doing in 2019 something I’ve always wanted to do, but couldn’t because…? (Fill in your own long-squelched desire, and inability to pursue it.) Relatedly, ask yourself, “what part, or parts, of my already-lived life would I like to let go of now?” …so I can begin in 2019 to do something (name it) that I really want—or believe I might like? Our approach offers a NEW FUTURE to those who answer no to the first question; have a gnawing answer for the second; and may, or may not yet, be able to clearly answer the third. People who know at some level that they want something more, different, and better for the rest of their life. Something new! Q5: How do people get started with their own Conscious Aging as a Spiritual Practice? A: One way is to read many books that seem to pertain to your particular needs. That is what led me to begin my 45-year plus research and practice. The good news with this approach is that you will learn a lot. The bad news is that is like the Biblical desert wanderings it takes a long time and leads DIY types into a lot of areas they don’t need to go, because their needs are typically different than the authors who write their books. Another way is talk to us and see if we can help you faster, and maybe even better as we concentrate on your needs. We recognize that undertaking any journey into an unknown new future is scary, which is why we offer a free, no obligation, introductory consultation where prospective clients can evaluate if our program is right for them now, in their current circumstances. If clients choose to go forward, we will draft a covenant that establishes our mutual expectations for a number of sessions, and a date to review and revise it. This is not a firm contract. It can be modified or cancelled as suits our mutual needs. This introductory consultation can be arraigned through our website newfutures.ca, where interested parties can learn more about what we do and have done for others. Alternatively, send me an email at paul@newfutures.ca. Q: What got you interested in this concept of a NEW FUTURE for Older Adults? A: My own difficult history of adversity. One shaped by psychological abuse, poverty, and the trauma of socio-economic instability that denied me any semblance of a “normal” childhood. And my near 70-year quest for psycho-spiritual respite from that. One that while “successful” by many measures, still leaves me with many wounds and insecurities. Q: What got you interested in this idea of Conscious Aging as a Spiritual Practice? Note that I said “midlife, not middle age.” They are different things. One of my first learnings what that I conflated the two, because I was engaging both concurrently. In the process of dealing with my own issues I learned that middle age is a statistically fixed time: half of normal life expectancy, more or less. Since our culture encourages us to avoid talking about the reality of mortality, especially our own, some people manage to stretch middle age to its breaking point. If you believe people with something to sell middle age people, it includes 70-somethings. According to a broad multi-disciplinary literature, the primary characteristic of Midlife is evolving personal awareness of emerging new issues and questions about the meaning of life generally, and our own specifically. So, where middle age is about chronology, midlife is psycho-spiritual. Metaphorically, this is akin to a first and second half of life. For example, I have a 30-something acquaintance, currently dealing with childhood adversity, who realizes his physical illness has a lot to do with his acquired psychological beliefs, reinforced by his self-talk. Simply put, they made him sick and are complicating his recovery. Another person, a workshop participant a few years ago, went through his midlife crisis in his mid 20’s. Abandoned by his mother and bounced around the foster care system in childhood, where he was repeatedly abused and humiliated, he found himself actively considering suicide. He shared with us his dramatic mid-20’s encounter with his innate, deeply hurt and badly damaged soul, where he felt he had two choices: kill himself to escape his other-inflicted pain and soul-sickness, or try a different way to live. Fortunately, he realized he was more and better than his vile history, and began the process of finding a better way to be alive. In the process he self-discovered his true self, and self-parented himself to health. And learned to love himself. Fortunately, most of us have never experienced that degree of life trauma. But scientific research shows that two-thirds of us have experienced childhood adversity that continues to affect us across the whole course of our life. And that a one out of four of us suffer life-limiting consequences well into our late adulthood and elderhood. Even more fortunately, our program of Conscious Aging as a Spiritual Practice offers significant improvement, and repair. And a whole new sense of future possibilities for their life. Which is why we emphasize a NEW future. One so very different from their past. Q: Why do you place so much emphasis on new possibilities and a new future? Life experience and scientific research, however, agree that growing into and mastering life’s second half is a lot more difficult than simply repeating this affirmation. That’s because our history has much more influence on our todays and tomorrows than you might believe. In truth, few of us really choose our future. As I said, we usually habitually and unconsciously move directly from yesterday, though today, into our tomorrow without thinking too much about it. There are two problems with this. First, is that the three phases of life’s second half do not lend themselves to simply doing more of worked more or less well in the first half. Secondly, this tactic is like sleep-walking through the only life we have. Committing to a program of Conscious Aging as a Spiritual Practice (CASP) is like waking up to a new set of possibilities.